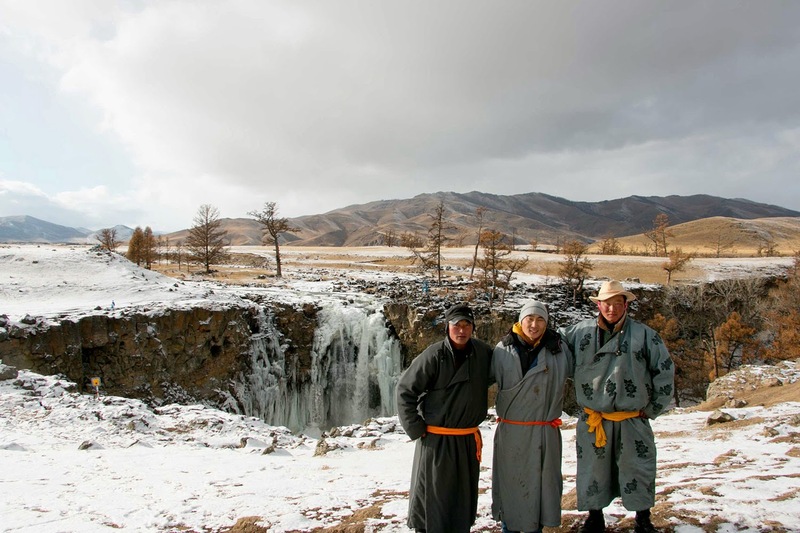 I booked a tour from the hostel I was staying at in Ulan Bator, SunPath hostel. 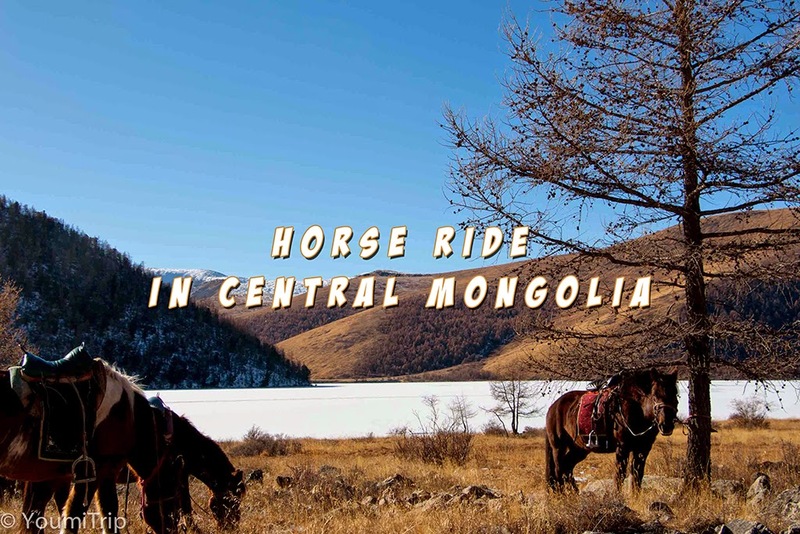 7 days in Central Mongolia including a 4-day horse ride... sounds good. I was very excited although I have been warned that it was going to be pretty cold - and it was. So we left the hostel early in the morning. I was with another English girl who was taking the tour as well. 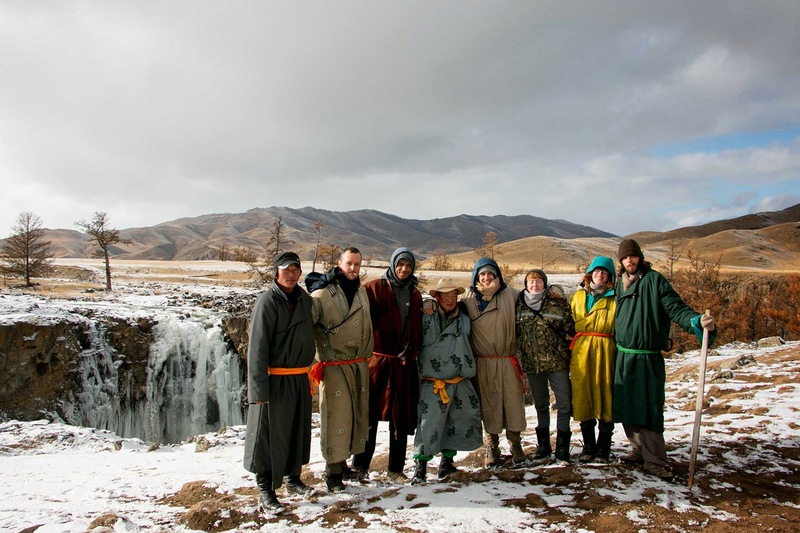 We were goign to meet another group in a city about 5h drive outside of Ulan Bator. 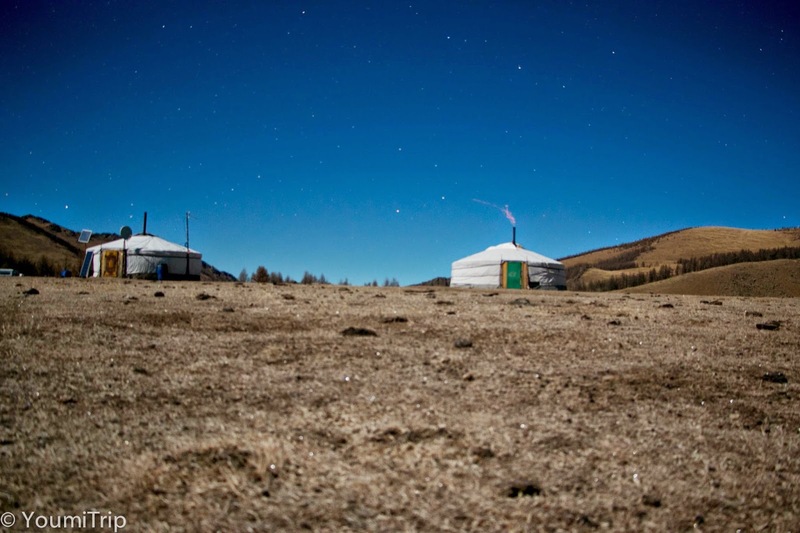 The others already had spent 7 days in the Gobi desert and were on their way to Central Mongolia. They were 4, a Swiss French couple, a Swiss German guy a a Canadian guy. Good alternative to keep in mind when we know that our forests are being devastated. When you first arrive at a family ger camp, you first go to the family ger, and they serve you goat milk tea, which is hot goat milk with some water and a bit of salt. And it's really tasty. Depending on the family this ger can be the one where they both cook and sleep in, or sometimes it is just their "living room". But they are always very well decorated with very colorful furnitures and items. 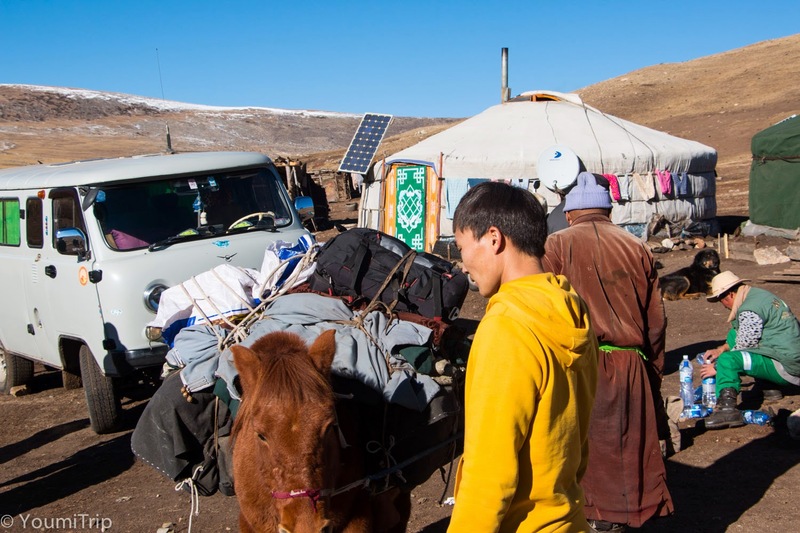 They obviously don't have current electricity obviously but they use solar panels to charge car batteries to power their TV and give them some light. A fully environmental friendly home. 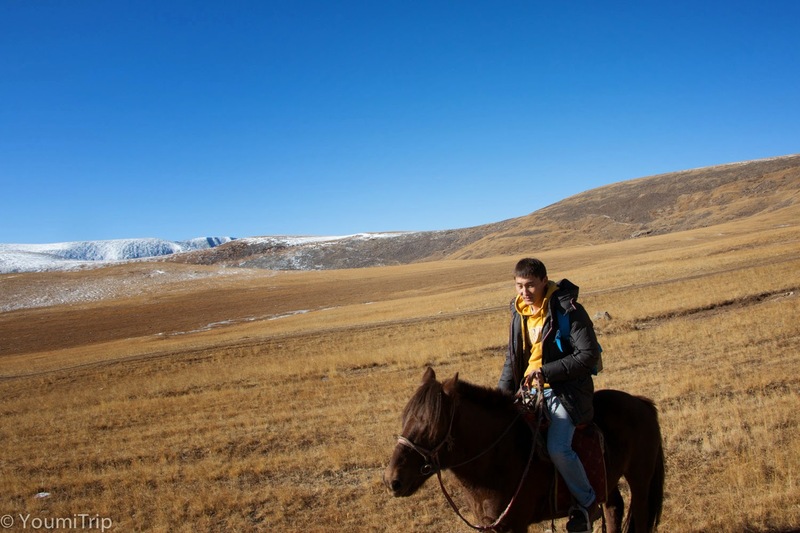 The next day was the first day the horse ride. 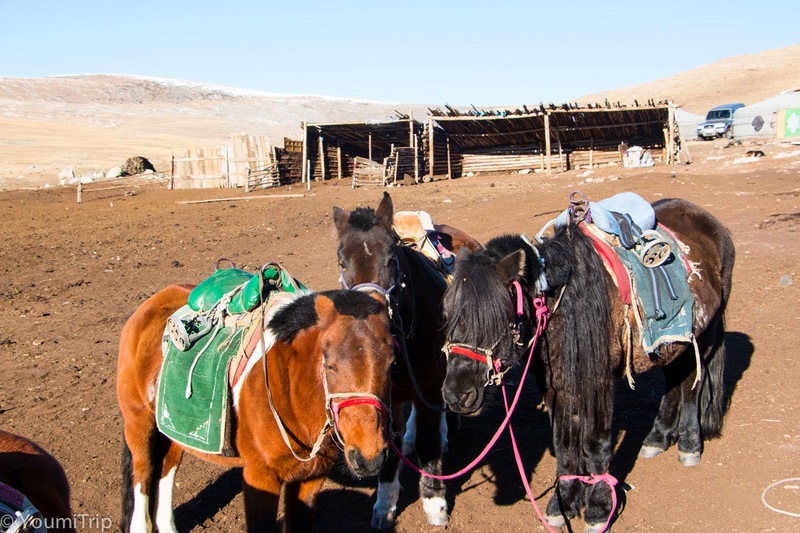 Mongolian horses are smaller than the one we're used to in Europe, but they are strong. I obviously brought my quadcopter with me for this trip. 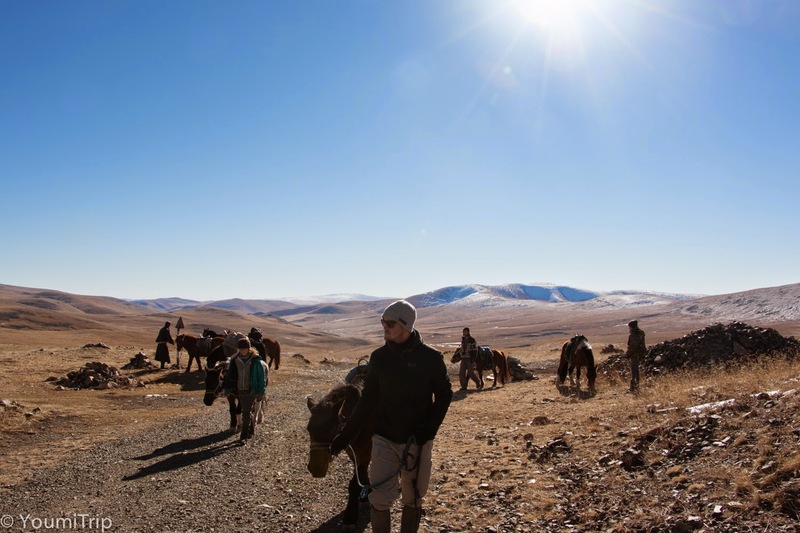 We were going to meet our driver at the end of our small trek 4 days later so I decided to take it with me during the horse ride as well. Being quiet heavy with the quadcopter and some clothes, I had to put it with the rest of the bags straped to the packing horses. But they were really nice and understandable that what was inside was quiet fragile. They did not tied it too tight. I was a bit concerned for my quadcopter but for nothing as usual. Off we went. 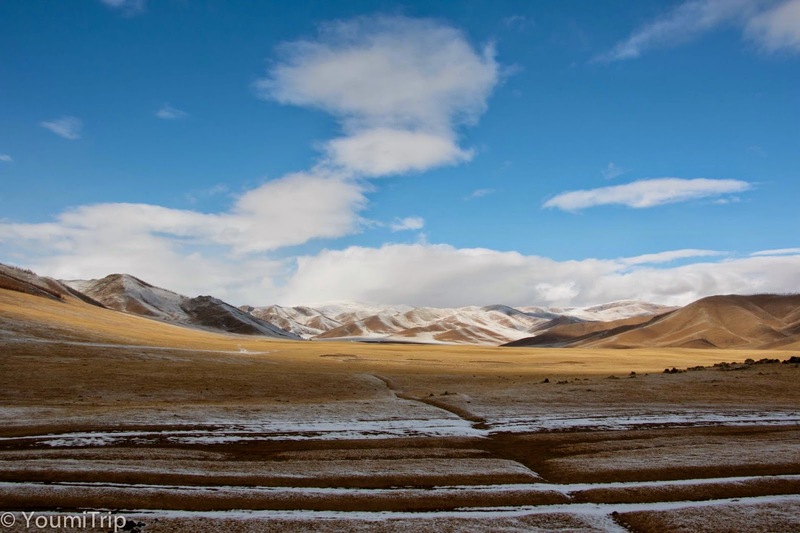 We had not started for more than an hour and already I was amazed with the landscape. I am not going to try to describe it as my English vocabulary is quiet limited so I let you have a look at the pictures which will talk for themselves. "Tchou" and a little kick was the signal to make your horse go forward. But trust me if he doesn't feel like "tchouting", he's not gonna go anywhere. It worked sometimes but honestly, the whole time I felt like my horse was pretty much doing and going wherever he wanted. I was quiet ok with that - like I had a choice - except when he was stopping every few meters to eat, or when going through a forest he would just pass right next to a tree with low branches. But when I wanted him to stop to take picture, oh no, mister horse had to keep up with the other ones up front. We've had some arguments... I did not win, ever. I suspected him to do it on purpose or to not care at all that someone was on his back. but overall we've had a pretty good relationship during those 4 days. 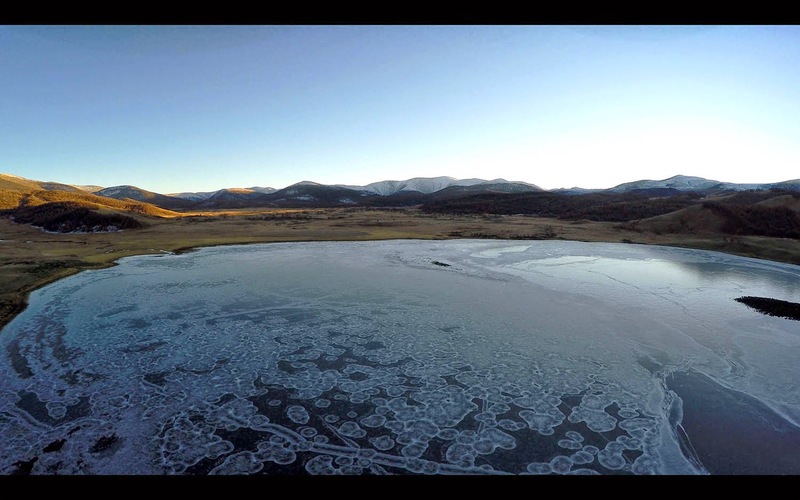 At the end of the day when we reached the family ger we were going to stay at I had some time to fly my quadcopter and film this beautiful landscape from above. 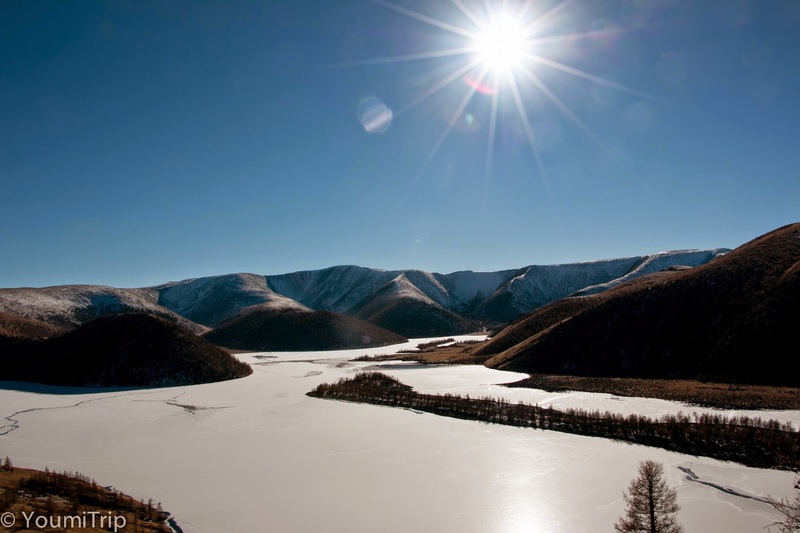 Before I left Ulan Bator I had bought an extra 3 batteries since most of the ones I had were not doing well in the cold waether. Well it turned out that the ones I bought did not do so good as well. Just to get a couple of minutes out of one of them I had to keep them on me the whole day while riding the horse to keep them warm. Quiet disappointing and frustrating when you are going through such landscape and have no way to recharge the only 3 batteries that work properly. So I had to make choices on what to film. The second day was another sunny one. We were going to stay at the same place and spend another night there. So in the morning we were free to explore the surroundings. 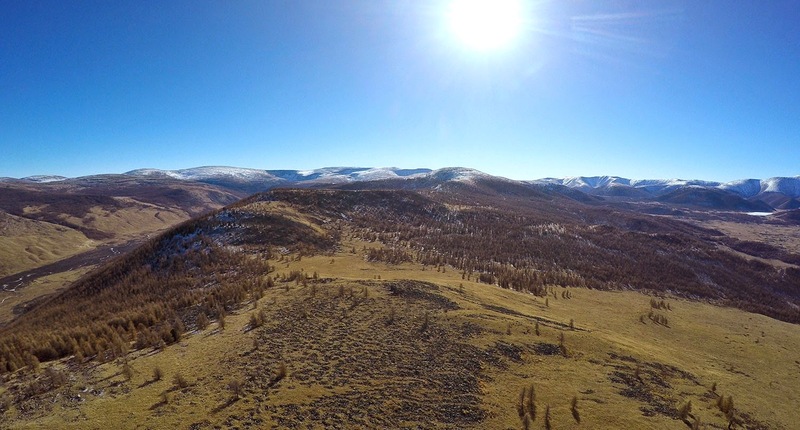 I climbed on top of one of the surrounding hills to get a nice view of the area and flew my quadcopter again. In the afternoon we went for a short 2 hours ride. 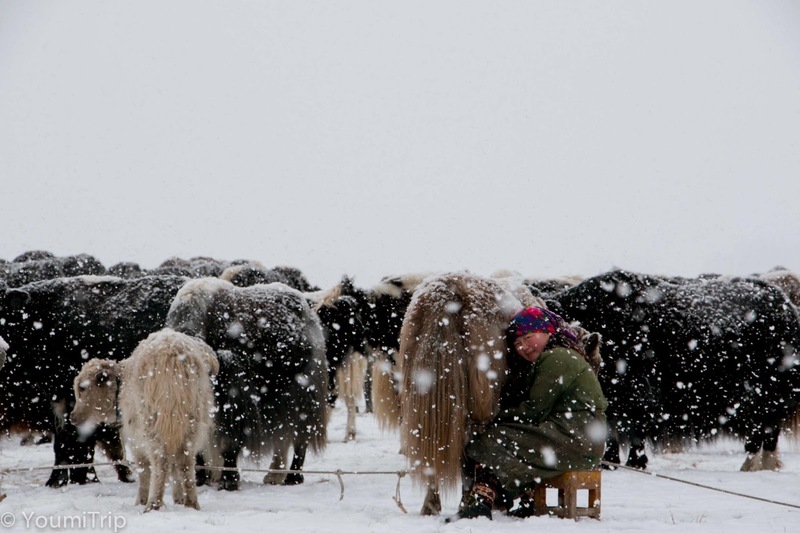 A quiet ride, we just went around in the neighborhood and brought back a horde of yaks for the family we were staying at, well, our horsemen did, but we were there... watching. 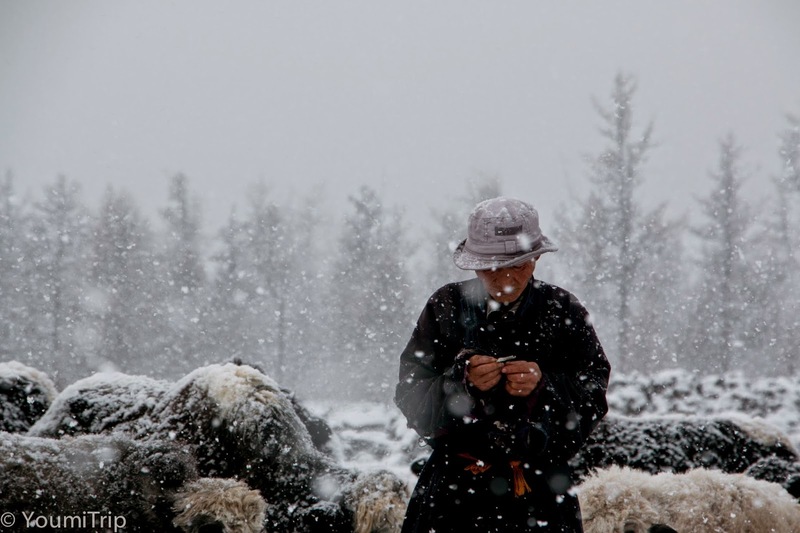 One of the young yaks had an empty water bottle tied in front of his mouth. They put that on the young ones when they are 2 years old, so they stop trying to milk their mother. The ger we were staying in was the coldest one of the whole trip. The bottom was basically open, you could put your hand and feel the grass outside. So when the fire ran out in the middle of the night, let me tell you that it was freezing. I don't think that I have ever been so cold before. And we had two sleeping bag, yes two. One was one of those green Koren military sleepping bag and the other was a regular one. Even with the latter one put inside the military sleeping bag it was cold. So I was not too excited to spend another night in this ger. 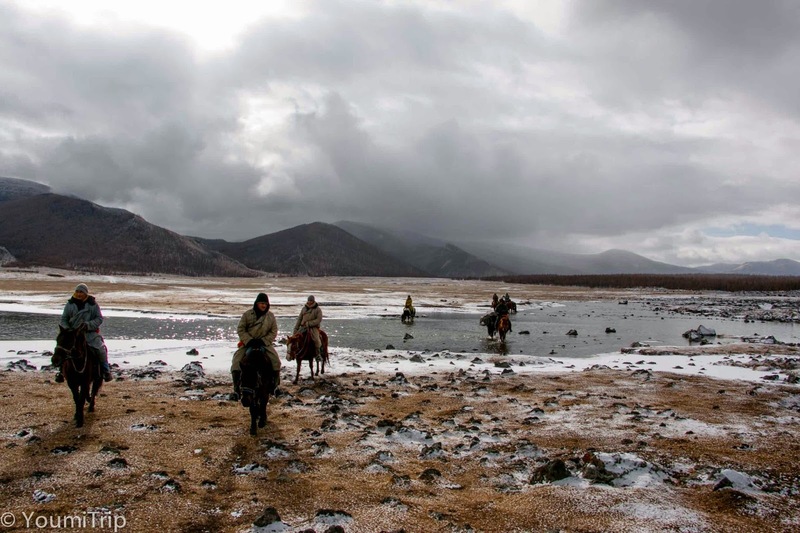 The next day the weather was not so good and I was getting pretty cold on the horse. My feet were. But again, the beauty of scenery helped get my mind around it. 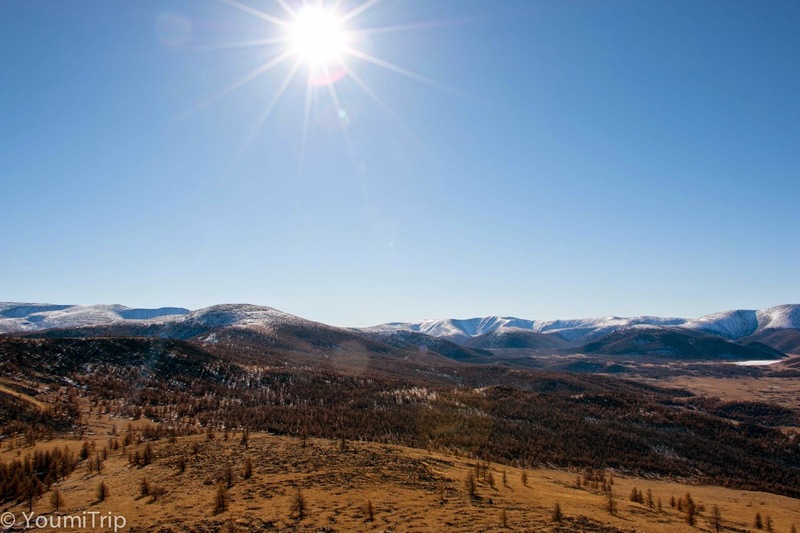 Landscape changed completely and the hills were replaced by flat forestry landscape. Uneventful day. 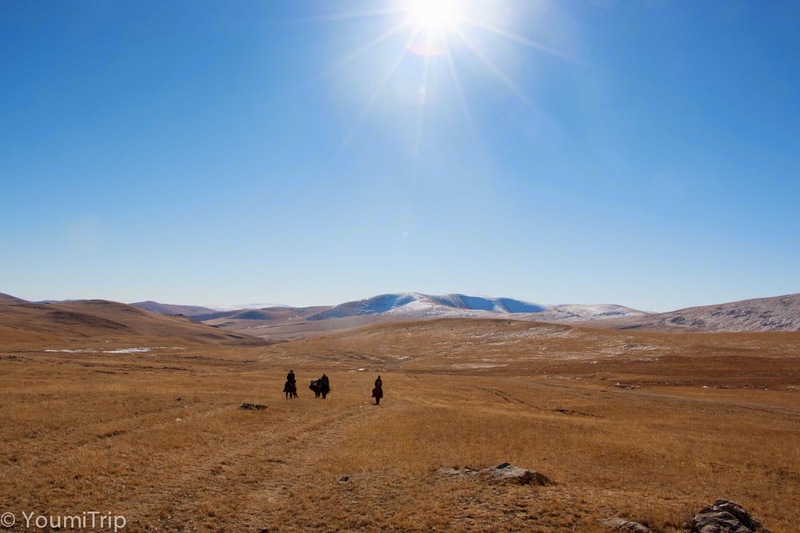 if I may dare to say that knowing I was in the middle of Central Mongolia and that everything was eventful for me, even seeing horses out in the open was an event like I had never seen one before. The highlight came from the family we were staying at. So full of life and joy. We were staying in the ger where they prepared the food so I finally got to see how it was prepared. Quiet impressive given the space there is in a ger with 8 other people and the one big stove in the middle to cook. The family had 2 adorable children, a little boy and a gorgeous little baby girl. The meals are essentially composed of noodles or rice with mutton meat, potatoes and sometimes carrot and pepper. But I think the last two items were there because of us. It is good, but when you are not used to it, eating mutton every day at every meal becomes getting hard on your stomach, especially after 7 days. And the next morning... Snow! snow everywhere! what a treat for our last day. And as if the landscape was not beautiful enough, it made it even more dramatic and amazing. 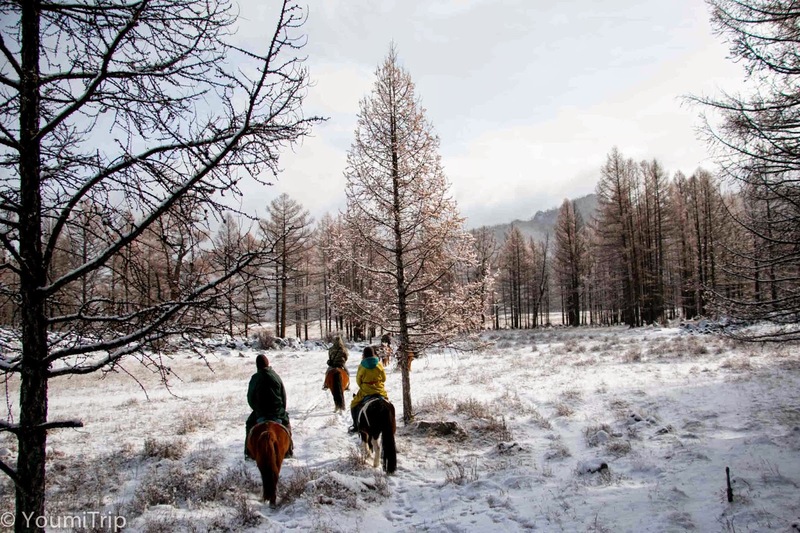 Of course it was colder than the previous days, and when you're on a horse, well, your feet get really cold. At least mine did. But the surroundings help you get your mind off it. 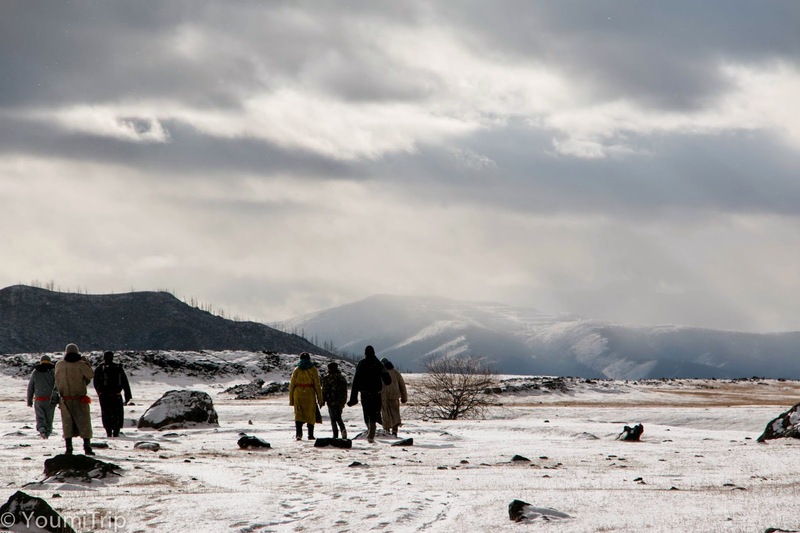 Riding in the snow in the middle of mountains, some of us wearing traditional Mongolian outfit, we couldn't help it but think of the Lord of the Ring - yes I know it was filmed in New Zealand, but still. 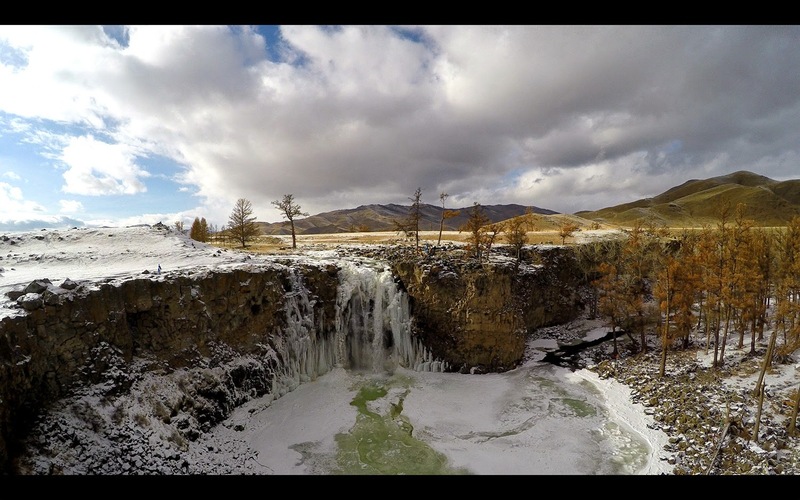 And the climax was when we reached the Orkhon waterfall for what would mark the end of our 4 days of horse riding. And once again, a picture says it all. 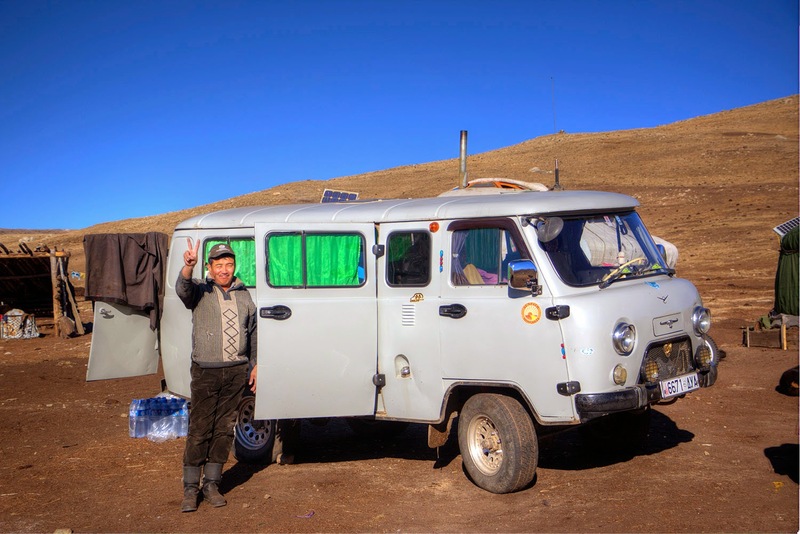 For the last 2 days of the tour we drove towards Ulaanbaatar and stopped in the Semi Gobi. Completely different landscape. 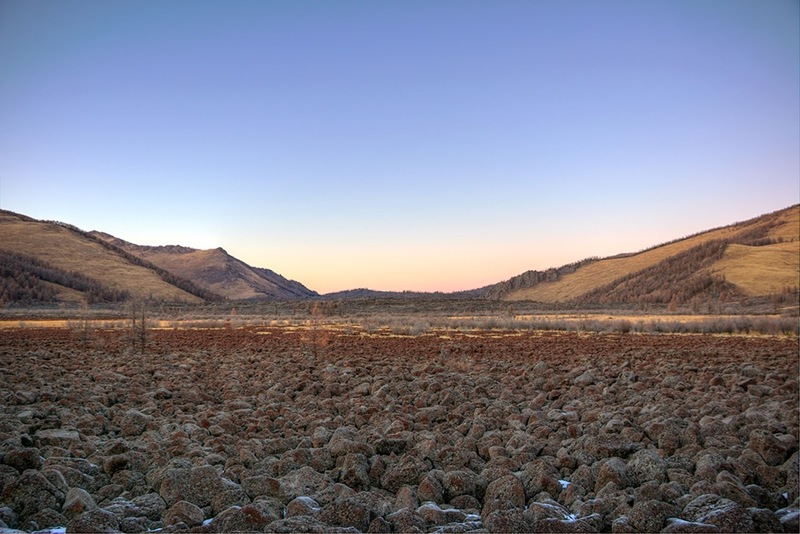 We went from snowy mountains to dry flat desert in just a few hours drive. On our way back, I guess we ran into a configuration that this Russian van of ours had a bit more of a struggle to overcome. We came to another of the many frozen rivers we've crossed on the "road" and our driver was driving along to find the best spot to cross it. The only bridge in the area was.... no more. 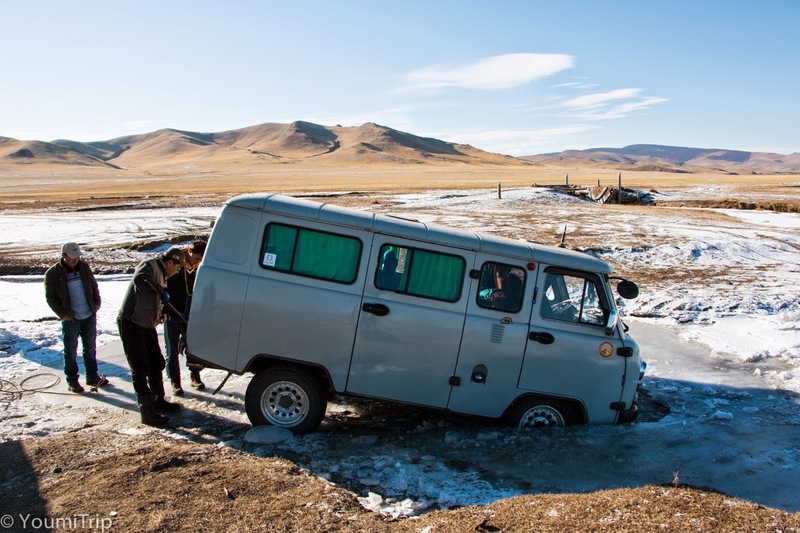 And when the driver engaged the van in the river, it went through the ice, but it collapsed more than usual, this river seemed to be deeper than the others. The ice was obviously not thcik enough to hold a fully charged van, but it was thick. "And we're f*****" was the first things the Swiss German guy - Robin - said as the van went through the ice. Yes, the van made it through, but this time it required some human intervention for it to go through the river. Those 7 days really were an amazing experience. Beside the landscape that was just breathtaking, - and I am sure it is at any time of the year - the people are just as amazing. Driving for hours in the middle of nowhere and reaching to those families leaving in their Ger with the bare minimum - according to our Western standard I guess - and seeing the smile on their face and how they welcome you, it really humbles you. They have a totally different way of life than the one we're use to. 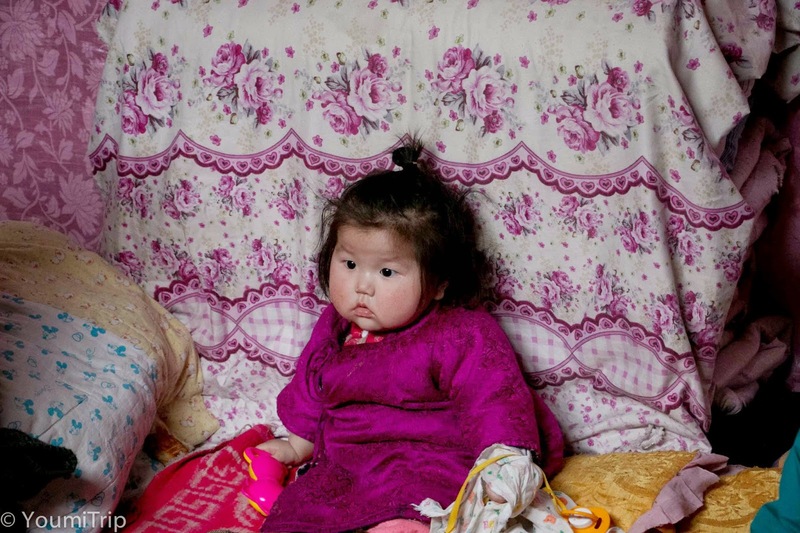 60% of the families in Mongolia are nomads. They have different shelters depending on the season. At the time I was there, they just had a few more weeks to spend in their summer gers before moving to their winter shelter. And no calls to "Les déménageurs Bretons" - famous French removalist - is possible. 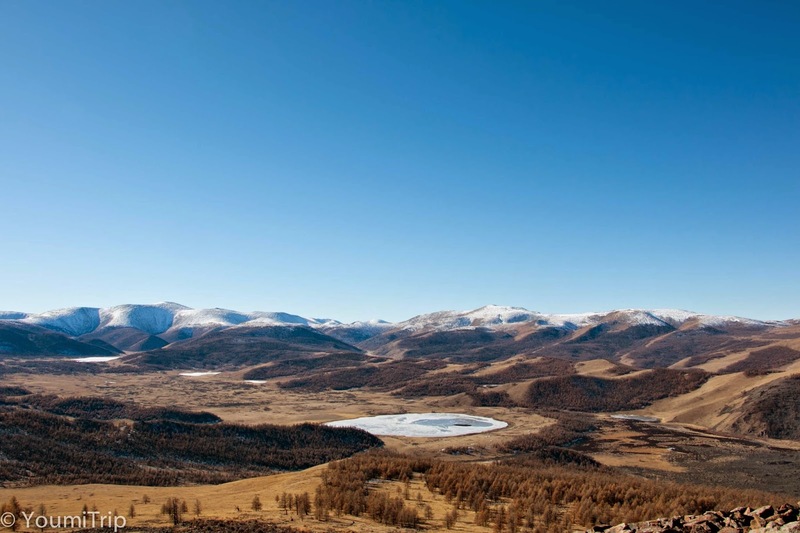 It definitely a trip that I highly recommend you to do if you have the opportunity.Have you already been to Central Mongolia before? 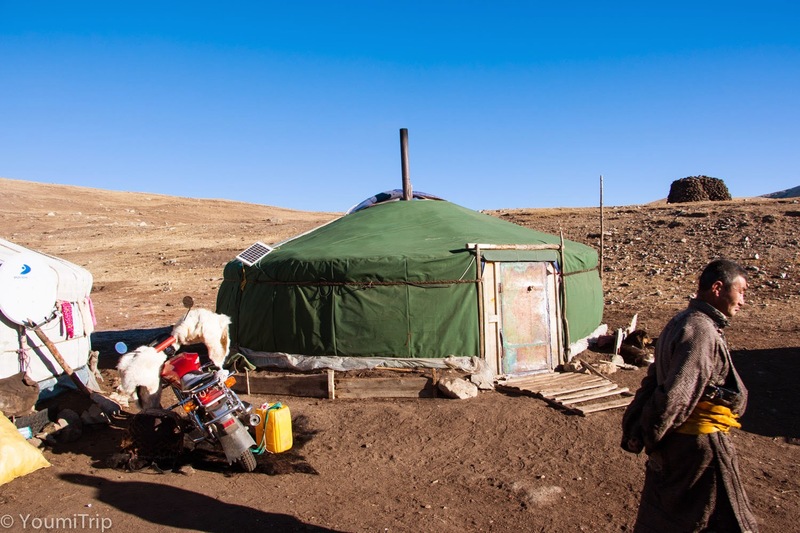 Or maybe you've been somewhere else in Mongolia? Share your experience in the comments.